The Wachovia Corporation traces its origins to 1866, when the First National Bank of Salem opened, with Israel Lash as president. Following Lash's death in the late 1870s, his nephew William Lemly closed the Salem office and moved to Winston, reopening the bank in 1879 as Wachovia National Bank. Wachovia is the Latin form of the name "Wachau," which was given to the tract of land in the Piedmont settled by Moravians in 1753. The name honored the settlers' connection to the Wachau Valley along the Danube River. With the advent of trust companies in 1891, a new enterprise, the Wachovia Loan and Trust Company, opened as a second Wachovia in 1893. The two enterprises merged in 1910, three years before the towns of Winston and Salem merged. The new Wachovia Bank and Trust Company had deposits of $4 million, with capital stock of $1.25 million and total resources of $7 million. It was the largest bank in the South and the largest trust operation between Baltimore and New Orleans. In 1985, after deregulation and the beginning of interstate banking, Wachovia merged with First Atlanta Corporation to create First Wachovia Corporation, an $18 billion interstate bank holding company with dual headquarters in Winston-Salem and Atlanta. Six years later the institution was joined by South Carolina National. L. M. ("Bud") Baker Jr. became chief executive officer of the corporation in 1993. By 1997 Wachovia was involved in major expansion throughout the Southeast. The acquisition of 1st United Bankcorp in Florida, combined with mergers with Central Fidelity Banks, Inc., and Jefferson Bankshares, Inc., in Virginia, gave Wachovia a retail network of more than 800 banking offices and 1,100 automated teller machines throughout Virginia, North Carolina, South Carolina, Georgia, and Florida. In 2001 Wachovia Corporation merged with First Union Bank; the new company, continuing under the Wachovia name, was headquartered in Charlotte. By 2006, after a merger with Southtrust Corporation, Wachovia was the fourth-largest bank holding company in the nation, with $542 billion in assets, 3,200 financial centers, and 97,000 employees. Pamela L. Moore, "From Absent to No. 1 in Va.," Charlotte Observer (25 June 1997). Wachovia Corporation, A History of Banking and Wachovia (1994). Search results in the North Carolina Digital Collections for 'Wachovia Corporation'. 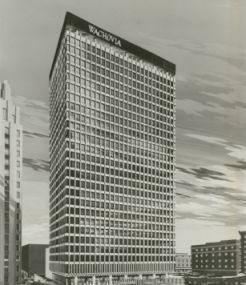 "Architectural rendering for the new Wachovia Bank Building at 301 North Main Street, 1962." Image courtesy of Courtesy of the Forsyth County Public Library Photograph Collection. Available from http://www.digitalforsyth.org/photos/8808 (June 28, 2012).